[Jesus] had to go through Samaria on the way [to Galilee]. Eventually he came to the Samaritan village of Sychar, near the field that Jacob gave to his son Joseph. 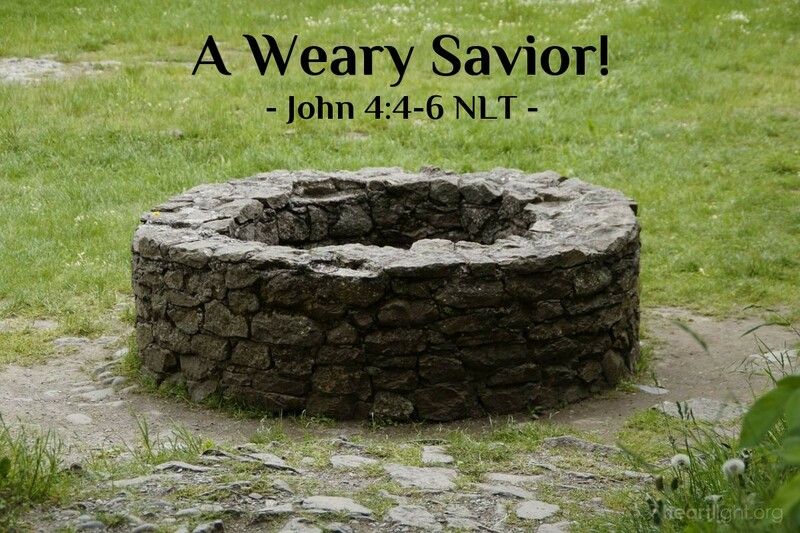 Jacob's well was there; and Jesus, tired from the long walk, sat wearily beside the well about noontime. Jesus took the "shortcut" between Judea in the south and Galilee in the north. He went through Samaria. He was tired from his journey. He rested by the historic site of Jacob's well. So much history and promise come together in this moment. We expect something grand to happen. Jesus has come to the well dug by Father Israel. (Jacob's name was changed to Israel, Genesis 32:22-28.) What great word do we hear from Jesus? What triumphant deed does he do? None. At least not at first. Jesus' primary initial action was simply to sit down. He was a weary Savior. He was tired. Sounds almost bizarre as our hearts exalt and hold Jesus in the highest of places. At the same time, something wondrous is once again revealed to us. Jesus became flesh. Human flesh. Mortal flesh. Wearying flesh. He knows us not only because he is God, but also because he was one of us whose feet got dirty, whose legs grew tired, and whose stomach growled when it was empty. Jesus is a Savior who knows us; he knows us not just because he is God, but also because he has lived in our world, sharing our burdens, and feeling our weariness. Father, how can I thank you for making yourself so accessible to me through Jesus? Jesus, thank you for becoming mortal for me. Your sacrifice has given me even greater confidence that I can come to the throne room of heaven and receive mercy and grace to help me in my time of need. Thank you, Lord Jesus. I praise you, dear Father, most holy and gracious God. Amen.